Larger Collection Cups - Juice more and drink more! This unit is a "multiple use" appliance that actually does all of its uses very well. Most appliances that are built for more than one use tend to compromise one task or another. But the Omega Model nc800 Nutrition Center excels at all of its functions. The nc800 auger turns at a low 80 RPMs to ensure that nothing is lost through heated elements in your juice. 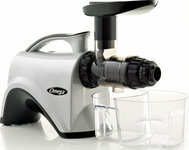 This low speed also helps the Omega nc800 foam less than a double gear style juicer. 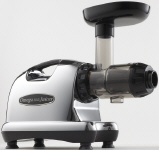 This heavy-duty juicer features a patented, stone mill-like screw, made of GEs ULTEM material, which is 8 times stronger than augers on other single auger juicers. The Omega nc800 Nutrition Center's low speed of 80 RPM's ensures full taste and the highest nutritional value. The Omega nc800 Nutrition Center is easy to assemble and disassemble for quick cleaning. The Omega nc800 Nutrition Center assures you many years of trouble-free, dependable service. Fifteen Year warranty on all parts and labor. 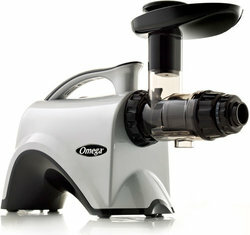 Omega nc800 Nutrition Center efficiently juices vegetables. It will juice vegetables like carrots, beets, celery,broccoli, and radishes without destroying the natural flavor and nutritional benefits. Fresh taste and full nutrition are guaranteed with this unique extraction process. Omega nc800 Nutrition Center efficiently juices fresh firm fruits. It will even juice citrus fruits, usually one of the hardest fruits to juice. It can also juice fruits like watermelon, cantelope, cactus fruits, firm apples, firm pears, cactus pears, seeded grapes, and more. Juicing fruits work best when juicing with vegetables. Soft fruits such as berries and bananas are better blended than juiced. 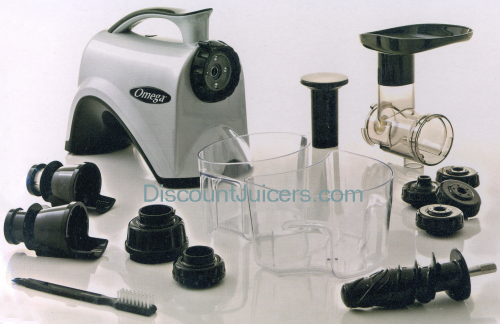 The nc800 is not recommended for juicing mostly fruits. Wheatgrass, kale, collards, chard, cabbage, spinach, and pine tree needles are just some of the natural products that can be juiced with the Omega nc800 Nutrition Center. Enjoy the best that nature offers in raw foods of all kinds and juice them for full nutritional benefits. Make fresh frozen desserts such as fruit sorbets that allow you to eat more fruits and less ice cream. Using fresh, frozen ingredients. Tip: Try peeling some ripe bananas, freezing in a zip lock bag, and then put it through the nc800 with some frozen strawberries.. Yummmm..
the Omega 8006 and Omega nc800? Due to these improvements yield is improved. Make your own nut butters with roasted peanuts. Some (raw) nuts with a low oil content will come out as a flour; and you will need to add oil to get it to stick together. The Omega nc800 Nutrition Center chops and minces, proving natural flavor and nutrition from garlic, scallions, red pepper, ginger and most other foods, including herbs and seasonings. The Omega nc800 will also allow you to make pasta. You simply make the pasta dough, and let the machine extrude the pasta-like shapes and cook... The nc800 will NOT make zucchini pasta. Can extrude the milk from the nut mixture when making soy or nut milks. Gets the pulp bone-dry. Also works great for making coconut cream. For best results blend nuts with water and pour mixture thru machine. Grind coffee beans for the freshest coffee you have ever tasted! Also works for cracking grains and even boneless meats into ground meats. The "Heart" of the New nc800 Juicer is its new black Heavy Duty auger made out of GE Ultem, which is 8x stronger than other single augers. The nc800 also boasts a 15 year warranty. The longest factory warranty available on any juicer! Low Speed 80 RPMs  Ensures full taste and high nutritional values. Powerful motor chews the plant fibers and penetrates membranes to extract vitamins, enzymes, and minerals. Continuous Juicing  Automatically ejects pulp into a pulp container that allows for continuous juicing. NEW More Durable Auger  GEs ULTEM material results in an auger is 8 times stronger than others. Includes 4 nozzle (end caps) to extrude pasta shapes. Quality Engineering  Heavy-duty construction using the highest quality materials equates to a juicer that is engineered to last a lifetime. User friendly - easy to assemble, operate and clean. 15 Year Warranty  The longest in the industry guarantees a confident purchase. 2 Horsepower equivelent with the gear reduction. Size: 14.5" x 6.5" x 15.5"